OBKA has long standing experience of running stalls at events throughout Oxfordshire. Our expert beekeepers will be on hand to give your audience a fascinating insight into the world of the honey bee, as well as raise interest in the craft of beekeeping. An OBKA stall provides interesting exhibits, including equipment for the management of honey bee colonies, how honey is extracted and the many uses of beeswax. We can also give live demonstrations working with real colonies throughout the summer months. 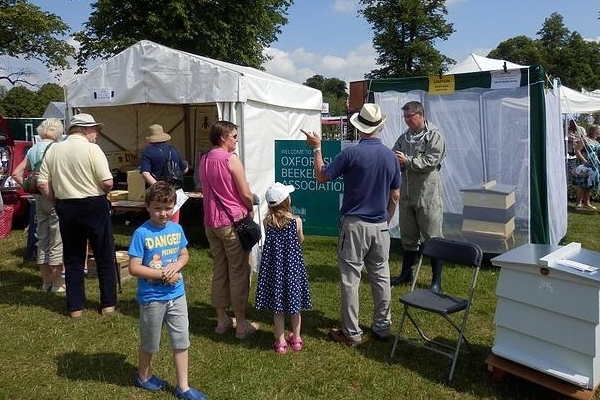 Attendees also benefit from the educational leaflets we provide to encourage new beekeepers and to inform the public about bee conservation and the plight of our pollinators. If you would like to invite OBKA to host a stall at your event, or would like to offer your assistance in organising and running a stall at a local event in Oxfordshire, please use the form below to contact us. Please note that we will use the information you provide in the form only to deal with your specific enquiry relating to an OBKA stall at your event. Please enter the letters in the box below to prove you are not a robot!